On August 4, 2017, a beaming Nasser al-Khelaifi unveiled Paris Saint-Germain’s newest recruit. The man he had signed was to be the figurehead of the final and most important phase of the PSG project, a player who was tasked with leading the historic French club to domestic success and continental glory. This, of course, was the same man who merely five months ago had crushed the team he was now joining, in one of the greatest Champions League displays of all time. The same man who orchestrated the biggest comeback in European history with a seven-minute display of breath-taking brilliance, who in that match, evoked memories of a certain Liverpool player, whose own genius display had led his team to glory in a European final. Neymar da Silva Santos Júnior arrived in France a PSG player in a move that still boggles the mind, and as the transfer market faced the prospect of a massive upheaval in the aftermath of the Brazilian’s transfer, it truly seemed as though Les Parisiens had finally secured the status of European royalty. In short, it seemed like PSG had finally arrived. But now, nearly two years and €222 million later, there exists a sense of disillusionment with Neymar’s time in PSG colours, a sense of promise left unfulfilled and hype left unjustified. For the second straight season, PSG must contend with missed opportunities in Europe, having once again thrown away a position that all but guaranteed victory. For the second consecutive season, PSG’s Brazilian talisman looked on helplessly as his team descended into chaos when faced with an opposition that took the game to them, as Les Parisiens wilted in the face of Manchester United’s desire to overcome all odds and secure yet another improbable European comeback. It seems a foregone conclusion now that Neymar will once again be ruled out of contention for any year-end honours, with teammate Kylian Mbappé’s goalscoring exploits placing him in pole position to snap up the Ligue 1 Player of the Year award. There is no question that Neymar has been sublime when he has played this season, but simple statistics indicate that it is Mbappé who will be feted when the awards season begins. It’s quite the fall for the man who had a Ballon d’Or clause inserted into his contract when he signed for the club, and somewhat tragically, never has Neymar’s chance of landing the award seemed more improbable than it does right now. So where has it gone wrong for the player once heralded as Messi’s heir? Has Neymar’s talent dimmed since his world record transfer? Or has he been let down by his teammates? Neymar’s numbers for his debut season in Paris were staggering. In 20 league appearances, the Brazilian racked up 19 goals and provided 13 assists, outdoing both his expected goals (16.54) and expected assists (12.28) in the process. He made 3.51 key passes over the course of last season, which was more than was registered by both Manchester City’s Kevin de Bruyne (3.05) and Barcelona’s Lionel Messi (2.61). However, Neymar’s impact on PSG extended well beyond the numbers that he put up, as he delivered superlative performances in the process of lighting up Ligue 1. The Brazilian’s home debut against Toulouse brought a 6-2 win for the eventual champions, with Neymar contributing 2 goals and 2 assists. There was that sensational performance against Dijon where Neymar scored 4 goals and contributed 2 assists on his way to attain a perfect 10 rating from French newspaper L’Équipe, a rarity for a publication that is typically stingy when it comes to player ratings. There was also time for a memorable performance in the Champions League group stages, as PSG hammered a demoralised Bayern 3-0, with Neymar scoring one and assisting another in the process. These are all memorable moments from €222 million man’s debut season, but seldom will you find them being discussed for any length of time. While the Neymar camp has been keen to paint this as media bias against their player, the truth is far more prosaic. The controversies that dogged Neymar’s first season at the Parc des Princes were such that they overshadowed whatever contributions that the Brazilian made on the pitch. The most prominent of these controversies – and one that would cause major fissures within the team – was ‘Penalty-gate’, the conflict that erupted over penalty duties between Neymar and Uruguayan striker Edinson Cavani. The issue first came to the fore in September during a match against Olympique Lyon, and while PSG ultimately won the tie, the post-game discussion was noteworthy for the emphasis placed on debating Neymar’s perceived attempt to usurp duties that Cavani had been shouldering since Zlatan Ibrahimović’s departure. Adding to the controversy were extraordinary reports which emerged after the match claiming that Cavani had been offered a €1 million bonus to relinquish penalty duties in favour of his Brazilian teammate, with PSG offering a paltry 19-word statement in denial of this claim. The issue hit a new level of absurdity as further reports emerged that the club had informed its players of the need for raising funds through sales to offset the club’s outlay on Neymar, a move which caused Blaise Matuidi to leave for Juventus for €20 million. Topping all of this was Neymar’s behaviour in the 8-0 decimation of Dijon, where the incredibly popular Cavani, poised finally to pip Ibrahimović and become PSG’s highest goal scorer, was denied the opportunity to do so by the No. 10, who had already completed his hat trick. It was a bizarre moment that revealed the amount of control that the Brazilian exercised at the club, and pointed to the serious fissures that had emerged within the team. Neymar’s dismissal in the Le Classique against Marseille and subsequent poor display against a rejuvenated Bayern only served to deepen the controversy surrounding the former Barcelona man, but there was still hope as PSG were drawn in the Round-of-16 against Cristiano Ronaldo’s Real Madrid. 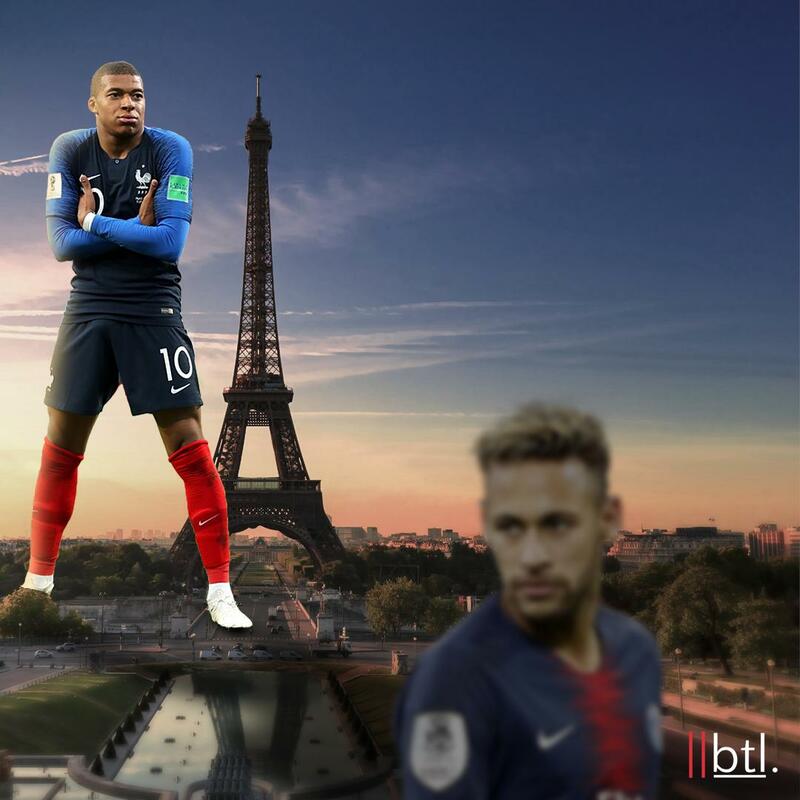 The narrative surrounding Neymar’s debut season with PSG was framed in a manner which suggested that his worth would be determined solely on the club’s progress in the Champions League, and it seemed fitting that the nouveau riche upstarts were paired with Europe’s biggest establishment outfit as far as continental glory was concerned. The clash of the two super clubs was a tantalising prospect and raised a number of talking points relating to Neymar and Cristiano, and it was expected that the match would live up to the hype generated by the stars who headlined the much-anticipated fixture. As it turned out, the tie proved underwhelming on both counts, with Neymar failing to fire and the football being patchy at the best of times. An early goal from Adrien Rabiot was cancelled out by Ronaldo’s 45th minute penalty, as Los Blancos came from behind to win the first leg 3-1, and although Neymar faded as the match progressed, it was hoped that the feral atmosphere at the Parc des Princes would spark the team into life in the second leg. Alas, it was not to be as PSG’s world-record signing suffered a fissure of the fifth metatarsal in the reverse league fixture against Marseille, which ruled him out of the second leg against Madrid. Devoid of their star player, PSG duly went on to lose 1-2 at home courtesy of goals from Cristiano and Casemiro, and as the demons of the still-stunning collapse against Barcelona threatened to swallow up Les Parisiens, the man who was brought in to be their saviour and talisman was nowhere to be found. While Neymar missing the remainder of the season was undoubtedly a blow for PSG, the nature of the injury was such that feverish speculation had built up surrounding the Brazilian’s ability to recover in time for the 2018 World Cup. The Seleção had a new coach in Tite, who had appeared to have finally found a balance between a loaded attack and an aging defence, and the skills of Neymar were understandably crucial in knitting and bringing the team together. As the recovery proceeded smoothly, Neymar seemed set to be the figurehead of the team considered as one of the favourites to win the competition, and once again, his statistics in the competition make for decent reading: in 4 games, he registered 2 goals and 2 assists. These numbers make it seem that Neymar was leading his team from the front, and to some extent it was true, as he single-handedly won his country the Round of 16 tie against Mexico by scoring the first and assisting the second. But once again, Neymar’s competition was marred by allegations of diving and playacting, as the Brazilian reportedly spent an astonishing 13 minutes and 50 seconds (of the 360 minutes played) lying prostrate on the turf. A full 5 minutes and 29 seconds of that came in the match against Mexico alone, and reports like these provoked sharp criticism of the player from fans and pundits alike. Perhaps it would have been a different story had Brazil progressed to the semi-finals, but mistakes from Fernandinho in midfield coupled with Neymar’s failure to beat an inspired Thibaut Courtois ensured that it was Belgium who progressed to the semi-finals at the expense of the Seleção. In contrast to the 2014 World Cup, in which a 22-year-old Neymar put his country on his back, leading them into the quarterfinals before succumbing to a nasty injury, he was overshadowed by Philippe Coutinho. In a coming-of-age tournament, it seemed as though he was doing more diving than leading. It didn’t help either that while Neymar was courting controversy, Kylian Mbappé exploded on to the scene, with the Frenchman’s scene-stealing performance against Argentina in the Round of 16 being a memorable marker in his nation’s run to victory at the tournament. The youngster was a key cog in Didier Deschamps’ workmanlike Les Blues as they stormed to their second World Cup, and Mbappé’s status as a homegrown talent meant that he automatically replaced Neymar as PSG’s most marketable athlete as far as the French market was concerned. This was a huge blow for Neymar, who was widely tipped to have left Barcelona to escape the shadow of Lionel Messi, but the Brazilian now found himself once again on the outside looking in, as a teammate bagged the adulation of the club’s supporters. A lengthy spell on the treatment table during PSG’s run-up to domestic glory in 2017-18 and disappointment in Russia meant that Neymar returned to Parc des Princes a noticeably withdrawn figure, with Mbappé replacing the Brazilian as Les Parisiens’ hottest commodity. However, there was good news awaiting the Brazilian, as PSG finally sent Unai Emery packing, with former BVB coach Thomas Tuchel arriving in Paris as the Basque’s hand-picked successor. The German had met with the No. 10 prior to his confirmation and was effusive in his praise for the Brazilian, dubbing him ‘an artist, an exceptional player, [and] one of the best in the world’. The Pep Guardiola disciple also spoke of finding a way to build a structure around Neymar, one which would enable the Brazilian to ‘showcase his real talent’, words which were widely interpreted to be attempts to bring the former Barcelona man on board with the manager’s new project. However, when the season began, it was clear that Tuchel was serious about his desire to provide PSG with a tactical structure, as he moved Neymar from his favoured left wing position closer to the centre of the pitch. The idea was to ally the Brazilian’s incredible vision with Mbappé’s pace and Cavani’s finishing, and it worked a treat, as PSG set a new record by streaking to 14 wins from 14 games in the 2018-19 Ligue 1 season. During this period, Neymar recorded 10 goals and 6 assists, outpacing his expected goals of 8.36 in the process. Tuchel’s decision to use Neymar more centrally was a clear masterstroke as PSG massively outstripped their expected goals of 38.42, scoring 46 goals as they raced to the top o the Ligue 1 table. But for all their success in the league, Europe continued to be a source of misery for PSG, as they fell to a listless 3-2 defeat away to Liverpool and drew 2-2 with Napoli at home. Despite these two performances sandwiching a sublime 6-1 showcase against Red Star Belgrade, it was difficult to see how PSG would escape the Group of Death, and the match against Liverpool on November 28 was consequently earmarked as a crucial fixture which would determine the club’s European future and possibly, Tuchel’s future as PSG coach. The shifting 3-4-3 structure (with Marquinhos shuttling between central midfield and defence) employed by the German coach clearly helped PSG gain numerical superiority against Liverpool’s 3-man midfield, but the star of the night for the home side was unquestionably the €222 million man from Brazil. From start to finish, Neymar ran the show as Les Parisiens dominated the Reds on the counter, with the Brazilian first setting up Juan Bernat’s opener before netting the second himself. Liverpool’s surprise defeat against Red Star Belgrade prior to the game with the French side meant that PSG’s European fate was finally in its own hands, and a goal and assist in a 1-4 away thrashing of the Serbian side in the final group game ensured that Neymar and PSG progressed once again to the Round of 16. Drawn against José Mourinho’s floundering Manchester United, it was felt that PSG would finally buck the trend and progress to the quarterfinals for the first time since 2016, but it was not to be as Neymar suffered another metatarsal injury on January 23 against RC Strasbourg. Once again, the Brazilian faced the prospect of missing out on the crucial pair of games in the season, and surely enough, PSG were sunk 2-3 on aggregate by Ole Gunnar Solskjaer’s rejuvenated Manchester United, despite recording an impressive 2-0 win at Old Trafford in the first leg. The defeat was sealed by a Marcus Rashford penalty deep into stoppage time, which admittedly was contentious, but even with that, it is difficult to justify Neymar’s extraordinary social media rant against referees and the VAR system. The incident sparked criticism as the Brazilian once again found himself on the wrong side of public opinion, and perhaps inevitably, the No. 10 also found himself in trouble with UEFA, with the governing body charging him for his comments against the referees. For all his brilliant performances in the league, this was the most high-profile incident involving Neymar in the 2018-19 season, a far cry from where the Brazilian thought he would be when he first signed for the capital outfit back in 2017. Once touted as a future Ballon d’Or winner, Neymar has all but disappeared from the scene of football’s most prestigious individual prize, with Luka Modrić being the one to finally break the Ronaldo-Messi duopoly on the prize. Brought in to elevate PSG from a desperately unlucky outfit into Champions League winners, it is clear to see that Neymar has failed to live up to the expectations that have placed upon him. Having missed the crucial home stretches of both seasons at PSG, he has failed to make his mark on the decisive occasions which he was brought in to take charge of, and his absence from the end-of-season award shows makes it painfully evident that the Brazilian’s stock has taken a massive hit from his injury woes and underwhelming World Cup run. As the situation currently stands, Neymar has to wait until next season for a shot at European glory, and the No. 10 will be 30 by the time the next World Cup rolls around. In the meantime, the 2019 Copa América has taken on a renewed importance, with Neymar facing the fight of his life to justify his status as the world’s most expensive player. At 27, there is still time for Neymar to conquer the biggest prize that club football has to offer, and to reinforce the prevailing opinion that he is the closest thing to Messi in terms of sheer numbers and style of play. There is a need for the Brazilian to transition into a Messi-like playmaker in order to reduce his reliance on pace to beat his opponent, as well as to minimise the risk of injury when he finally makes his return. The manner in which Tuchel has utilised him this season has confirmed views that Neymar can thrive in the classic No. 10 role, and that is the role he needs to adopt as he enters his peak years. There is still time for Neymar to write his name into PSG history in more ways than one, and if one thing is clear, it is that he certainly has the skillset to scale the same heights that Messi and Ronaldo have. There are challenges aplenty for Neymar to overcome as far as his PSG career is concerned, but the Brazilian still has the talent and temperament to make his mark as one of the all-time greats of the modern day game.